Understanding the emotional reactions of audiences to a wide range of content types is an important area of research. In this article, I provide a personal reflection on various approaches to modeling, quantifying and understanding audience behavior based on a broad range of evaluation techniques. Using results from a study of the Heineken Weasel television commercial as a backdrop, I provide an overview of evaluation approaches and their impact in long-Term and real-Time evaluation. 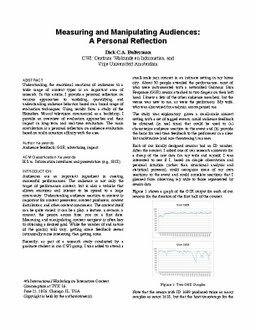 The main contribution is a personal reflection on audience evaluation based on multi-situation affinity with the area. Bulterman, D.C.A. (2016). Measuring and manipulating audiences: a personal reflection. In CEUR Workshop Proceedings.